The cautious, reasoned Jules is moved and elated by Lee’s survival, but she knows their relationship was over when he left and over now: ” … as though a six-week whirlwind romance easily withstood a year-and-a-half’s separation … where one of the parties had been presumed dead … and the other was boinking someone else.” Jules wasn’t then, isn’t now, prepared to take on Lee’s volatility; as she characterizes him, “He dropped into her world and blew normal to smithereens” Except there’s a complication. Lee has amnesia (cue the soap score); he’s back from the dead (cue intense soap score); to comfort his buddies and family after his funeral, Jules had accepted Lee’s engagement ring from them. As far as Lee will know, Jules accepted his proposal. Jules also forged a relationship with Lee’s father; indeed, their relationship was loving and close. She was with Lee’s father when he died. She became an integral part of his army buddies’ lives and their families. Her best friend, Claire, now married to one of them (widow to the one they lost, Ross, and heroine of Bring Him Back) says she’s part of their “tribe.” Lee’s amnesiac self assumes Jules is his faithful fiancée. How can she tell him the truth? He was beaten, tortured, traumatized … and now he’s going to be dumped? No way. Jules is too decent a person and loves Lee too much to hurt him thus. On the other hand, she has to protect her heart and sanity. She decides to go along with the engagement, nurse and help Lee as much as she can, and release him into a new life, resurrected, renewed. Lee has very different ideas. He’s hurt, diminished, and angry, most of all at the woman who finagled her way into his father’s life, his family, his friends, the woman who inherited his estate and sports his rejected diamond. It turns out Lee is NOT suffering from amnesia, but will pretend doing so to seek revenge against Jules. How ridiculous does this sound? How unlikely? How absurd? How melodramatic? And yet, it works! Because Bliss writes with a masterful combination of irony and humour and yet never allows the pain and tragedy of her characters’ lives to ebb. She also creates a terrific pairing in Lee and Jules. Lee is broken, but so smart, he can fool anyone: but his post-hostage trauma is beyond him. He has to realize this. All he wants is to be the same man he was, but he won’t be. He’ll be as strong, but not the same. Miss Bates loved how clever, angry, and peevish Lee was. Yet, his trauma was beyond what this charming, formerly-well-adjusted man could hide. His determination to punish Jules was paranoid and nasty, but understandable as well. It gave him a focus, so he didn’t have to think about what to do with himself, to decide what to do next with his life. He could, by hurting Jules, ignore his PTSD. In Jules, Bliss created his perfect foil. Jules is so clear-thinking: she never denies her love for him while she never lets him get away with his BS. She cares about and for him; she’s gentle and loving. But she’s smart, reasonable, and reads him well. She calls him on everything, but she never stops letting him know with words, touches, gestures, and actions (like maxing her credit card so he can buy clothes and feel like a well-dressed man again) how much she loves him. In the end, she also doesn’t let her own need for caution stop her from loving and committing to him. Lee takes her on a merry ride. However, as we get to know him, we recognize that he deserves her. He has qualities: courage, integrity, and an ease in understanding and admitting his feelings that Jules can learn from. One of Miss Bates’ favourite moments occurs when Jules and Lee meet at the airport upon his return to New Zealand: “Stepping forward, she leaned her forehead against his jacket, gently, blindly. ‘I have to make you real.’ With a muffled oath, he released her elbows, his arms clamped around her shoulders and he bowed his head over hers. For long seconds they stood there.” While this scene precedes Lee’s amnesia-charade, it is a very cleverly orchestrated one. It is a moment of raw emotion and open-ness before two characters clam up and return to their hidey-holes of shame: Lee, to revenge, anger, and paranoia; Jules, to control and emotional distancing. It’s important to Bliss’s purpose that she establish this moment of tender love and honesty. It will have to hold us in good stead while Lee wreaks his havoc on his buddies, most of all, on Jules. “What’s your last memory of us?” she said. Yeah, you’d like this to be easy, wouldn’t you? “And what if I want there to be an ‘us,’ Jules?” he challenged. Irony depends on the reader being privy to some vital information to which at least one of the characters isn’t. With Lee, we watch Jules flounder and lie. He knows she rejected his proposal; she knows she did, but is unwilling to hurt him in his present state. What’s doubly ironic is that Lee assumes she wants to squirm out of the engagement (he also accuses her of taking his inheritance). It’s all part of her vilification in Lee’s mind. But we, the readers, are also privy to Jules’ love for Lee, her fear of hurt and being out of control. Yet, she never stops caring for him and his family and friends, never hesitates to do everything she can to make his recovery happen. We also know that Lee, damaged and hurt as he is, will have to come to a point when he admits he still loves Jules and she’s not the villain he’s made her out to be. As the reader, we’re in the privileged position of pondering both the comedy of the set-up and its eventual dénouement in pathos, love, tears, admittance of hurt. And how sweet it is when it arrives; Lee ponders “Revenge wasn’t sweet, it was corrosive, and he needed to rebuild his life. These games had to end.” Romance cannot sustain irony: the truth of the heart will foil it every time. This breaking open of the self to the other happens in one of the rawest, most powerful scenes Miss Bates has read in the genre: really, it’s of the Molly-O’Keefe-variety of vulnerable. It’s terrific: it may not feel comfortable, but it feels right to the characters and the story Bliss wants to tell. Romance, like Portia’s caskets, has to open the secrets of the heart, lay character open, free character to live in communion with his feelings and others, in particular the beloved, who is both catalyst to, and recipient of, love. (Take, for example, the most famous of revenge tragedies, Hamlet: what if Hamlet joined forces with Ophelia? What if, together, once the truth was offered and accepted, they evaded the world of realpolitik? What if the warrior culture, the code of Hamlet Sr., was supplanted by the code of romance?) As for irony and romance, hit Miss Bates with your thoughts. Can romance sustain the ironic mode throughout a narrative? Miss Bates thinks not. What say you, dear readers? 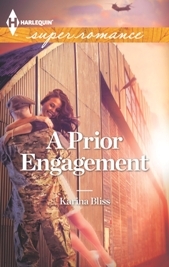 As for Karina Bliss’s Harlequin Super-Romance, A Prior Engagement, Miss Bates loved it; Miss Austen says “there is no charm equal to tenderness of heart,” Emma. I love this book, too, although I don’t have your discipline and I gobbled it up right when it landed in my kindle. I reread it not long ago before I read her newest book Rise. So many twists and turns in this book….just when you think they’re going to work it out, something else shows up. I can FINALLY read Rise … now that I read this one. The TBR Challenge was a great motivator to let the hoarding go. I mean there’s another Bliss for me to read! After you read it , sign up for her newsletter and you get a great free scene. She’s self publishing the rest of that series so I don’t want to miss anything! I love this line: “Romance cannot sustain irony: the truth of the heart will foil it every time.” Right now I can think of only two romance authors who manage to sustain irony, at least for a while: Jane Austen and Georgette Heyer (I read very little contemporary romance so my examples tend to come from the classics or histfic). But when it comes to the HEA, the narrators in both cases must distance themselves enough from the happy couple’s POV to poke gentle fun at them (I’m thinking especially of Austen’s Emma). I’m curious to know if there are contemporary authors who use their narrators this way. That is a great point about Austen: it’s true that Austen is a distanced narrator. She is as much satirist as she is romantic: she is everything, isn’t she? Her books are so rich. I don’t think that the romance is primary either: she’s using that as a structural fulcrum in which she can tell of “other things” in a lady’s form. Nevertheless, she is comedic in her endings, as Frye would have defined it, ending in a wedding, betrothal, etc. and as Regis avers. This is why she is usurped so easily by the genre and rightly so, I guess. She is one of its natural mothers. I can’t really think of a sustained contemporary treatment of irony, especially one that pokes fun at its protagonists. (Maybe Crusie, though not, ultimately; maybe Lerner, maybe Barry … but, romance must, I think, rescind irony to be romance.) I hope others join the convo because I’m feeling the limitations of my mind here. I thought of Heyer as well. And it’s definitely in the distance of the narrator. I haven’t read these books, because most romances about this war really upset me too much to enjoy them. Maybe in a few more years? But I did love Rise! I can’t wait to read Rise! Zander makes a great appearance in A Prior Engagement! What a wonderful review! I don’t usually read category romances, but you are making me want to try this. I especially enjoyed your comments about the handling of irony…a device not utilized well in many romances I read. Category romance is the one area of romance where I really do rely on reviews, simply because there are so many to choose from at one time and others on their way, that I want to choose carefully. Once an author has proved to be a master of this short, intense romance form, I’ll keep taking a chance on her. Bliss is not prolific, but when she has a book out, it’s been proven, over and over again, that it’ll be terrific. In my estimation, she’s got Sarah-Mayberry-track-record, but a shorter 😦 backlist. Okay, I’ve been hoarding this one too and now I think I’m going to have to read it. Love your comment about hoarding titles for a bad day. I totally do that,too! There are so many “I better hold onto this in case Author X never writes another book” titles in my TBR it isn’t even funny. I think it’s possible to sustain irony to the end if there’s something about the MCs worthy of it, but it doesn’t provide the immersive reading experience romance readers are looking for, which is why Austen writes something close to genre romance but with less centering of the love story and a different tone. At the risk of seeming elitist, that’s why Austen’s novels are literary classics and genre romance isn’t. Then there’s the possibility of irony aimed at secondary characters like Rev. Collins. (Or is he Mr. Collins?) That’s always possible. Courtney Milan’s Trade Me aims some irony in the direction of an important secondary character and his relationship with one of the MCs. Yes, most definitely to everything you said about Austen. I think that Austen used the romance in her novels as a basic frame, or structure. It was one thing she wanted to say, but there were so many others. And satire is what I “hear” most prominently in her novels. I believe he is Mr. Collins: obsequious and ridiculous, a marvelous invention.